First of all I have to make clear that if you have never seen the “RAMONES” with their original line-up, you certainly have reasonable doubts when you hear that there is only one of them left playing their classics. That was one of the main reasons that kept me away from all the previous appearances of “Marky Ramone’s Blitzkrieg” here in Greece. But now it was time to regret it. I arrived at the venue at 21.10 approximately and the support act “Mamma Kin” were already on stage. They certainly put up a good show and know how to get the crowd warmed up. They played for almost half an hour more or less; including some covers from “Dead Boys” and “The Who” .Their only minus was the bad sound during their show especially in the back of the venue. The time was 22.30 and the place was packed. The big lights started to fade away and it was finally time for the band to hit the stage. One thing I noticed immediately was the rest of the band members. Marky Ramone was there and so was Michael Graves from Misfits, but the rest of the band was two look-alikes of Johnny and Dee-Dee! Now that was a surprise indeed. 1-2-3-4 and “Rockaway Beach” was playing to take us along the journey. The sound was very good and the crowd was responding at all times. The band was really into the part and you could definitely tell from the very beginning that this was gonna be a hell of a great show. We got from song 1 to song 10 in a matter of minutes. The tenth song was one of my all-time favourite RAMONES songs, “Beat On The Brat”. I really couldn’t believe how perfectly the songs were played although I’m not a great RAMONES fan. The entire band was participating 100% in the songs, ending the first part of their 24-song show with “Pinhead”. They went backstage for a very little while just to catch their breaths and back on the stage to deliver the goods once more. The first part of the encore was more than satisfactory, including songs from the “RAMONES” and “MISFITS” to covers from “Creedence Clearwater Revival” and “Motörhead”. 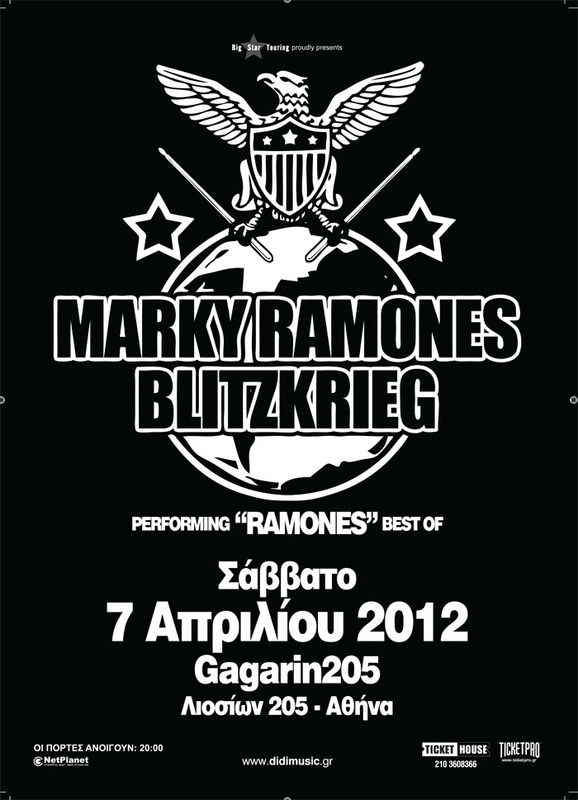 The show ended with “What a Wonderful World” and “Blitzkrieg Bop”. I believe that even if they played for two or three hours the crowd would still be asking for more. It was one of those gigs with a certain “party atmosphere” that you don’t get very often. Everyone –including me- left the venue with a big smile on their face and that says a lot. We definitely wanna dance with Marky once more!